Nestled at the foot of the Arbuckle mountains and surrounded by seven lakes totaling 100,000 acres, Ardmore is one of Oklahoma's most unique communities. Its strategic location on I-35, just 90 miles from either Dallas or Oklahoma City, gives Ardmore a unique market proximity. 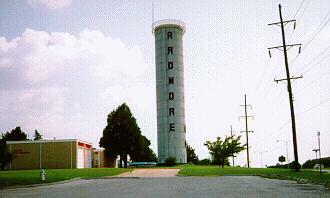 The north Ardmore water tower at Cottonwood and North Commerce. This water tower is one of the first things you see when coming south on Interstate 35 off the Arbuckle Mountains when you are about 15 miles north of town.